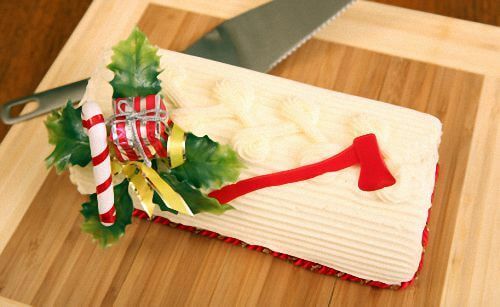 Use these Yule Log recipes to create beautifully decorated cakes to serve on Christmas Eve. The log-like cake symbolizes the ancient custom of the Yule Log that burned for twelve nights until Epiphany. However, these cakes won't last twelve nights as the original oak logs did. They are far too delicious! Our family often enjoys a Yule log cake on Christmas Eve after a midnight church service. When the children were young, we'd serve the cake and sing Happy Birthday to Jesus. Try these vintage Yule log recipes and make a traditional dessert for your Christmas celebrations. Five ounces fruit sugar, 5 ounces flour, five eggs. Beat fruit sugar and yolks of eggs together until light. Add flour gradually, and then fold in the stiffly beaten egg whites. Spread on shallow pan, covered with greased paper, and bake in moderate oven. When cool spread with a boiled custard, roll like a jelly roll, leaving a hole in the center, which can be filled with whipped cream. Decorating a yule log is easy. Just cover with mocha frosting, "ridge" roughly with a fork (see photo), and sprinkle with finely chopped pistachio nuts (optional), and lightly dust with icing sugar for snow (optional). A sprig of holly is traditional. Cut both ends on an angle to represent a Yule Log. Very Good! Line a 10 x 15-inch jelly roll pan with waxed paper. Do not grease. Cream butter and sugar. Add egg yolks and beat well. Sift dry ingredients and add alternately to creamed mixture with milk. Fold in stiffly beaten egg whites and wafer crumbs. Bake at 350°F for 20 minutes. Turn out immediately onto a damp towel liberally sprinkled with fine sugar. Carefully remove waxed paper, trim crusts. Roll cake up along narrow edge. When cool, partially unroll, then fill and frost with lemon flavored whipped cream. Chocolate frosting can be substituted for the whipped cream. Delicious either way. Yule log cakes are part of an old Christmas tradition. "Yule" is simply another word for Christmas, while "Yuletide" refers to the Christmas season. The word Yule is thought to have originated with an ancient, pre-Christian harvest festival held in November. The Yule log is an ancient custom that survived into Christian times. Traditionally, a huge oak log was carried into the dining hall amid much celebration and lit on Christmas Eve. Then, the log was burnt each night until Epiphany, the feast of Twelfth Night, to symbolize the power of God's Light to conquer darkness. After it was extinguished, the remaining charcoal was kept until the following Christmas to kindle the next year's Yuletide log. The charcoal was also believed to protect the house from lightning and fire throughout the year. Now, the decorated cakes have come to symbolize the oak logs. 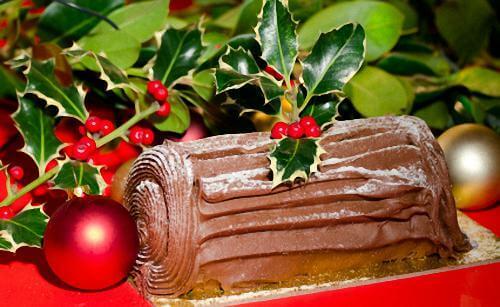 Bake a traditional Yule log cake this Christmas and delight your family. In Quebec, Canada, these cakes are known as la Buche de Noel. Xmas was once a common abbreviation of the word Christmas. The “X” comes from the Greek letter Chi, the first letter of the Greek word for Christ (Khristos). As the centuries passed, fewer people in the twentieth century understood Greek and thought the “X” has some secular meaning and that the word Xmas showed disrespect.